S&P 500 is a stock index composed by the share prices of the largest American companies, traded on the U.S. exchanges. This index is calculated by the rating agency Standard & Poor’s. It is calculated as weighted average market capitalization index of 500 largest companies. S&P 500 is calculated continuously every trading day, only during the trading sessions of the largest U.S. exchanges (NYSE, NASDAQ Composite) from 15:30 to 22:00 CET. For the rest of the time the index is not calculated. S&P 500 futures different in size and expiration date are traded on the Chicago Mercantile Exchange (CME). As an example of our CFD formation, we have chosen E-mini S&P 500 futures contract with the nearest expiration date. CME issues several futures, each one of them is traded for more than a year: one futures contract expires quarterly in March, June, September and December (on third Friday of the month). Thus, up to 5 contracts with different expiration dates may be traded simultaneously, but the contract with the nearest expiration date is the most liquid contract. These futures are traded on the working (trading) days according to the exchange schedule with small breaks during the day. To form our CFD, periods with low liquidity were excluded. As a result, we use the futures quotes from 02:00 to 22:00 CET. Thereby, the stock index futures is traded for 18 hours and the index itself is calculated for 6.5 hours during the trading session. 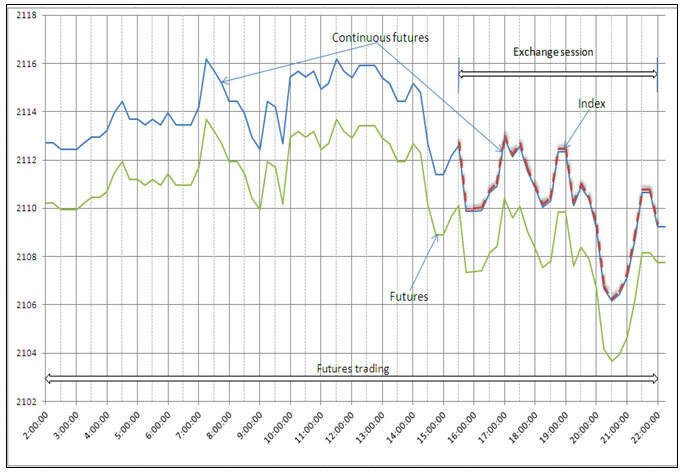 Moreover, the trading session is included in the futures trading session (see Figure 1). 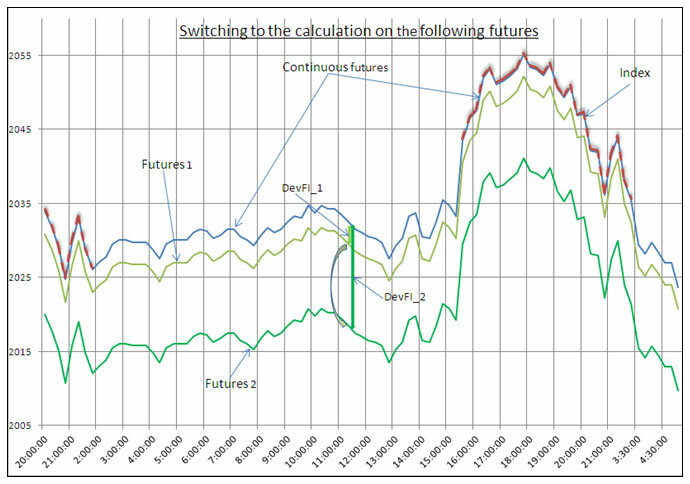 As a rule, the price of the stock index futures is above the index value (the situation “contango”) or below the index value (the situation “backwardation”) at a relatively stable intraday value (this deviation is denoted as DevFI). Outside the trading session (but within the trading hours of the nearest futures) the quotes of the Continuous Index CFD corresponds to the quotes of the nearest futures minus the difference between the futures and the index by the end of the last trading session of the previous day (in our example the trading session ends at the same time with the futures trading hours). Continuous Index CFD quotes = quotes of the nearest futures - DevFI, where DevFI = quotes of the nearest futures – value of the index at the moment of ending of the last trading session. As a result, the Continuous Index CFD is an extended index, i.e. an index, existing for the whole trading session of the futures. A few days before the expiration date of the nearest futures we automatically switch to calculation of the next futures, i.e. from DevFI_1 deviation for the nearest futures we switch to the DevFI_2 deviation for the next futures (Fig.2). The shift takes place when the liquidity of the nearest futures starts to fall and the liquidity of the next futures is rising to the high enough level. As a result, no gaps or sharp jumps occur on the quotations of the Continuous Index CFD at the moment of the shift to the next futures. Clients of IFC Markets may hold positions on such Continuous Index CFD for quite a long time. Moreover, the company is hedging clients' positions with the ordinary futures - closing, if necessary, hedging positions on the nearest futures and reopening positions on the next futures. This kind of technology allows traders to trade Index CFDs without worrying about their expiration dates.